Measure along the baseboard the length of one wall, from one corner of the room to another. For accuracy, measure to the nearest 1/4 inch. Record this number on your rough floor plan and in your notebook. Measure the remaining walls the same way you measured the first. Most rooms have four walls, but if you’re measuring an L-shaped room, you have more to measure. Include every wall in your sketch, especially if you plan to give one part of the room a different flooring or wall covering. Measure the room’s doorways and other entries. 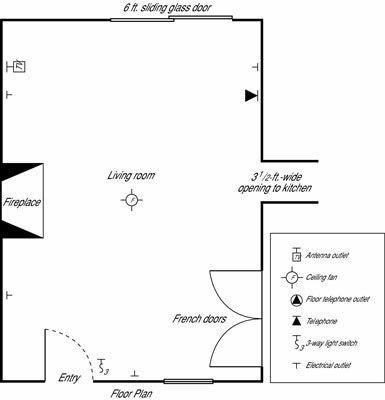 Note whether the door opens into or out of the room and indicate the direction (with an arc) on your rough floor plan sketch. Also measure the distances of all openings — doors and open archways — from the ends of the walls so that you can accurately locate these openings on your final plan. Determine the size of the windows. Include the window frame from outside edge to outside edge. Record the measurements for any moldings around the window separately. Gauge the distance from the floor to the bottom of the window frame, from the ceiling to the top of the window molding, and from the window (on each side) to the corner of the wall (or next window or opening). Measure any and all architectural features, including fireplaces, brackets, shelves, and any other built-in features. Measure surrounding space and outside or overall dimensions of these items, and then locate each on your plan. Measure the walls from side to side and from the floor to the ceiling. Measure where the electrical outlets, switches, and other controls are located. Note where heat and air conditioning ducts, radiators, chases (coverings for electric wires and plumbing pipes), and exposed pipes are located. Lightly pencil in the room’s major areas on graph paper before firmly committing to hard-to-erase dark lines. Include the room’s irregularities, such as support columns or any other intrusions. Note on the paper the room’s directional orientation (north, south, east, and west). The quantity and quality of natural light affects a number of decisions. Draw the room’s specifics, using a thicker straight line for walls, windows, and fireplaces. Note also the inside width of the doors and other openings so that you know if your sofa (or other large piece of furniture) can fit through the opening, up the stairs, or around a turn in the hallway. These factors all influence furniture placement. Don’t make the mistake of putting bookcases in front of the only phone jack in the room, loading up all the shelves, and then discovering that you can’t plug in your phone! The wall elevations are two-dimensional representations that help you figure out art and accessory arrangement or window treatment. Again, remember to mark all the permanent features, such as light switches, electrical outlets, phone and TV cable jacks, air conditioning and heat vents, and so on.